One of my big missions for 2017 is to get more organised. Nerys will be going to a pre-school class 5 mornings a week from the end of February, and I’m very aware that this means I’ll have 2 sets of school things to keep track of! I’ll have to remember who needs wellies on what day. I’ll need to keep on top of homework, and snack money, and signing (and returning) important forms. I’ll need to know what day of the week books need to go back to school, and make sure that both children have clean uniforms to wear each day. 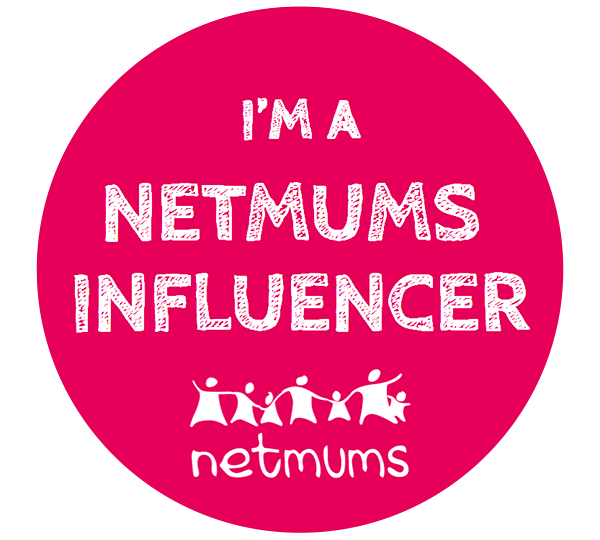 And that’s all before I even start to think about my blog and my business and keeping our house in check. There’s just a lot whizzing round in my head that I need to get down on paper so I can start to feel a bit more organised and in control of everything! So at the end of last year I started looking round for the perfect planner to help. I’ve always had diaries, but often find they go unused for large parts of the year because they don’t quite fit my needs. But I think I might have cracked it this year, with the Stick to Stigu planner. I’ve seen several rave reviews of these in the past, and thought they looked fab when I checked them out on the Stigu website. So I was thrilled with they agreed to send me one, along with a to-do list pad, to review. 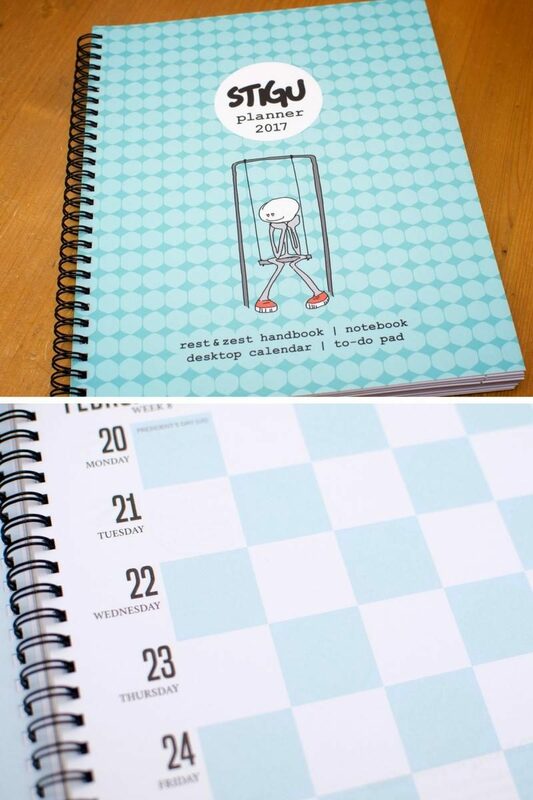 There are several things I liked straight away about this planner. Firstly, I love the colour and design. I know that sounds a bit superficial, but if I’m going to use something regularly I do like it to look appealing. And I just love the fact that this year’s planner goes so well with my blog’s colour! I also really like the size of it. The diary I had last year was just a little too small for me. I didn’t feel I had the space I needed to write things down and clear my head. 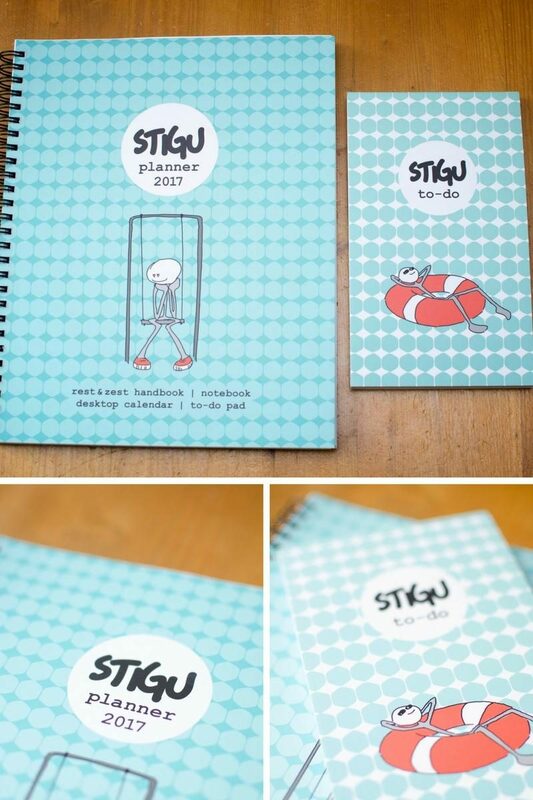 The Stigu planner, on the other hand, is 240mm x 190mm which is just a bit bigger than A5 size. So it will still just about fit in my handbag if I need to take it out and about with me, but it just feels more spacious inside. For each week you have a blank page on the left for writing down your to-do list for the week, or important things to remember, or for a bit of a brain dump at the start of each week. 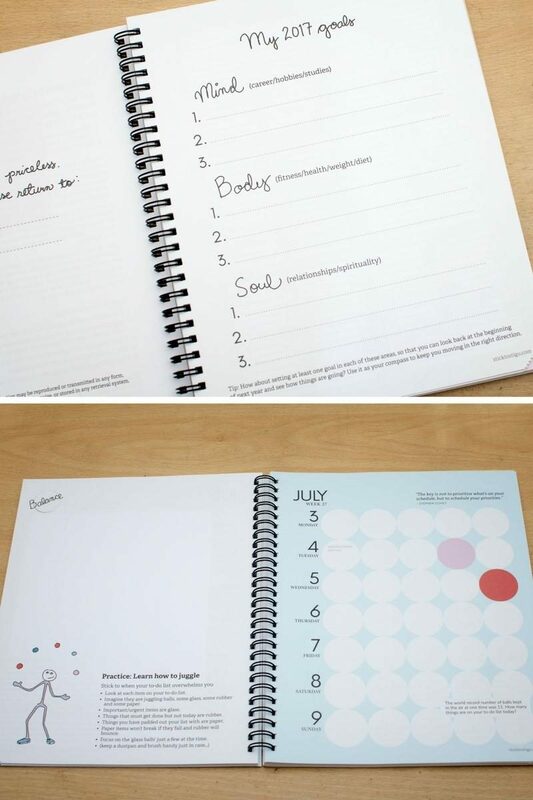 Then on the right side you have the week printed out with several spaces marked out for each day for you to put in meetings, school functions, birthdays, etc. At the front of the planner is a page to write down your goals for the year, for mind, body and soul, which I really quite like. And it also has 32 blank pages at the back, which is just so handy for scribbling down notes and blog post ideas. And there’s even a little pocket on the back page that you can use to keep leaflets, notes from school, etc. 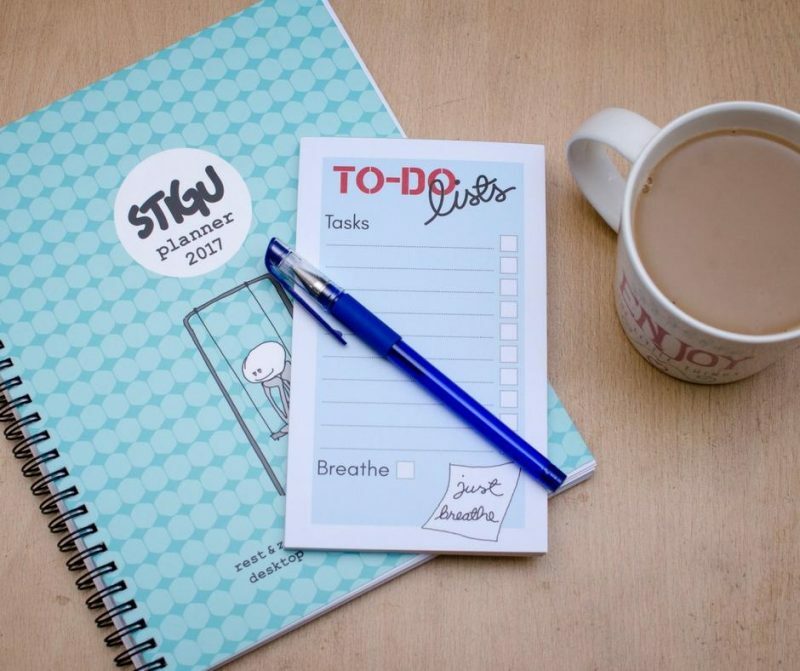 What really makes the Stick to Stigu planner special though is the little notes and quotes and tips that are included on every page. “Be like a wildflower: grow in all the places people thought you never would”. And you also get a lovely idea each week of a way to help you renew, relax, reflect, switch off from your to-do list for a while. “Inspire yourself. 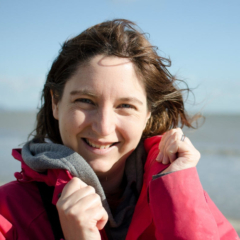 Stick to 5 minutes when you need to feel positive and centred. Breathe through the nostrils if they are clear, otherwise it is fine to breathe through the mouth. As you breathe in imagine that quality filling your lungs and permeating every cell. As you breathe out feel that negativity leaving every cell of your body. 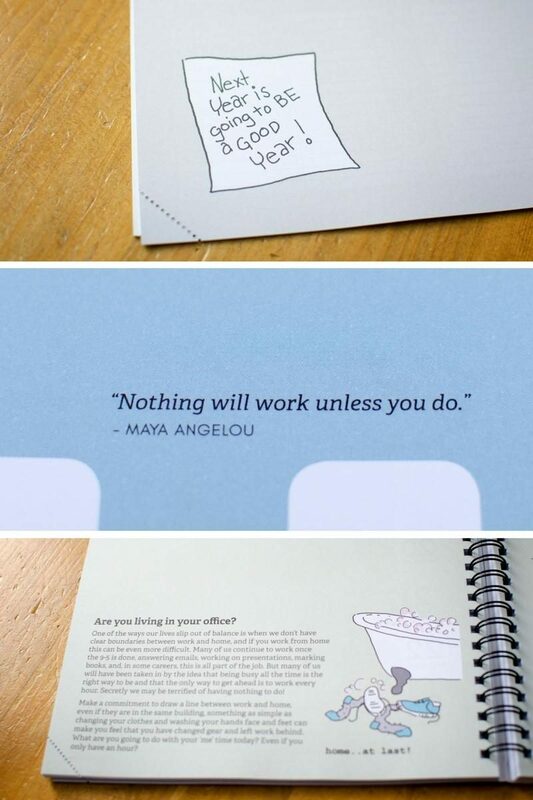 Now, come on, are there any other diaries that inspire you like that?! I’ve had my planner for a few weeks now, and I really do love having the space in the planner each week to write down all the things that I need to get done that week. But I also find that I feel a bit more on top of things if I write down a to-do list for the next day, before I go to sleep at night. So I know that I have it written down that I have to take Rhys’ books back to school that day. And that I need to pop to the shops to get milk. And that’s where the Stigu to-do list pad comes in. Now, I know I could just carry on doing what I’ve been doing, and write my little lists on scraps of paper. But there’s something about using a nicely designed, proper to-do list pad that just feels so much nicer! What I love about this pad is that there is only actually room for 10 tasks on each sheet. So I can’t overload myself with unrealistic lists of things I ‘need’ to get done each day. I can pick out the top priorities and put those down. And then there’s the lovely little box that I get to tick when I complete one of the jobs – so satisfying! I also really love that the to-do list pad includes ‘breathe’ every time. I love that little reminder every day to just chill out a bit, take a step back, grab a minute to just stop and breathe. 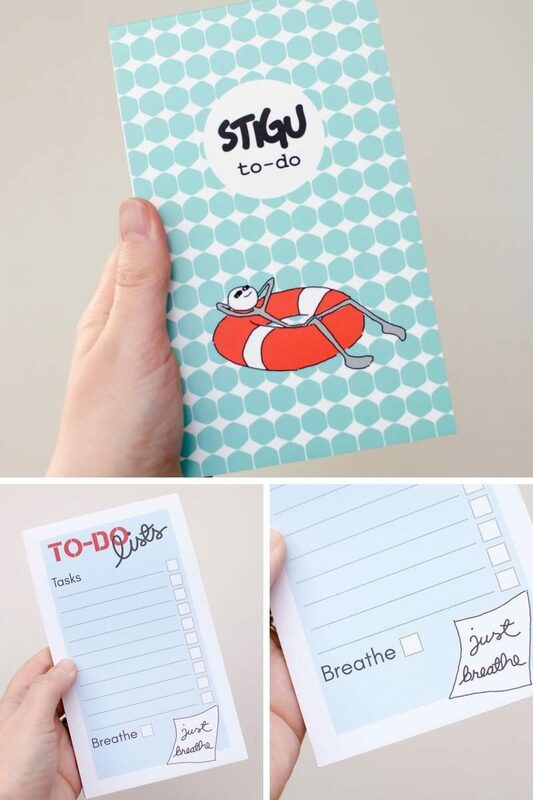 So far I’m really impressed with the planner and to-do list pad from Stick to Stigu. I think I have a pretty good chance of getting more organised this year using them. I’ll make a note in my planner to write a post at the end of the year about how I got on! 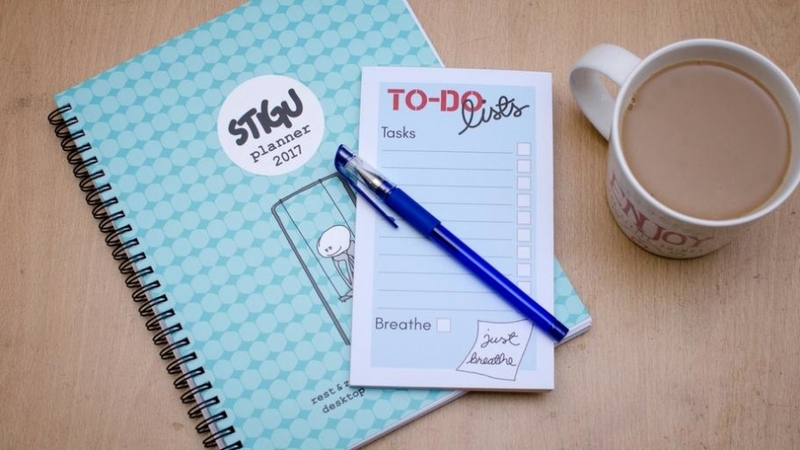 If I’ve inspired you to get more organised yourself, then head over to the Stick to Stigu website to pick up a planner of your own and see what other fab products they have on offer. Disclosure – I was sent the planner and to-do list pad for the purpose of this review, but all words and opinions are my own. I’ve tried various planners already this year and still searching for ‘the one’ this one looks like a great contender though. I love the To-do notepad too. I do like the look of these, I use a flat single sheet pad with days of the week on at the moment, which is really handy too.